China Pushes Back Against Currency Pressure - Integration Through Media ....! China’s central bank has announced support measures for the country’s sagging currency, but in the process, it may have highlighted the machinations behind its self-styled reforms. On Aug. 24, the China Foreign Exchange Trade System (CFETS) announced the reintroduction of a “counter-cyclical” factor in adjusting the value of the yuan renminbi (RMB) against the U.S. dollar to resist further depreciation. CFETS cited a “softening trend” and “lingering market expectations of continued slips,” the official Xinhua news agency said. 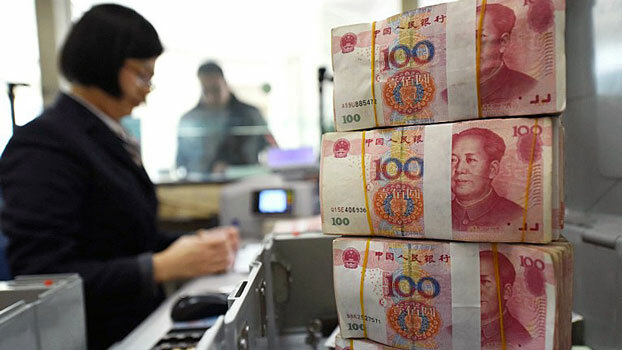 Three weeks earlier, the People’s Bank of China (PBOC) imposed a 20-percent reserve requirement on foreign exchange forward contracts to discourage short-selling of the yuan, but the value continued to fall. The PBOC “has never explained what exactly it means by the policy,” said the CNBC financial network. “Many understand the term to mean the central bank will try to fight whichever direction market forces are pulling the currency,” it said. At least one thing seems clear from China’s references to the “counter-cyclical” tactic. It is a far cry from freely floating exchange rate policies as practiced in most advanced economies. “Even though the latest measure could help stabilize the yuan in the near term, the policy shift means Beijing, once again, is backtracking on its efforts to make the yuan more market-driven,” said The Wall Street Journal. “To be blunt, the counter-cyclical factor appears to be nothing more than a black box that prevents calculation of how the yuan rate is fixed based on the procedure specified by the PBOC,” said Commerzbank senior economist Hao Zhou, writing in the South China Morning Post. In August 2015, the PBOC adopted the policy for its “market-based, managed floating exchange rate system,” which allows the yuan to vary by two percent against the dollar from a “central parity rate” issued daily. The parity rate, or midpoint, “is based on a weighted average of prices offered by market makers before the opening of the interbank market each business day,” according Xinhua’s daily exchange rate report. Who are these “market makers?” The CFETS statement on the “counter-cyclical” factor makes it clear. The first is that the market-makers are only China’s designated foreign exchange banks, which are more likely to take direction from the PBOC rather than to act on their own initiative to bet against market trends. The second point is that the market-makers are hardly likely to have acted on their own, given that the CFETS daily fixing on Aug. 24 weakened by 343 basis points before the agency’s after-hours announcement of the “counter-cyclical” move. The CFETS explanation for the change in the “market-based” policy suggests that it has been little more than a feedback loop between the PBOC and state banks. “The RMB’s value is politically controlled, as it has always been,” said Derek Scissors, an Asia economist and resident scholar at the American Enterprise Institute in Washington. “To the extent there’s any meaningful daily process, it gets thrown out as soon as the political leadership becomes uncomfortable with valuation,” Scissors said by email. There have been at least two reasons for China’s growing discomfort with the decline in the yuan’s value, which would otherwise give it a pricing advantage for its exports to help cope with tariff pressure. The first is that continued depreciation would raise the risk of capital flight, particularly at a time when U.S. stock markets have set records and Chinese markets have slumped. The temptation to evade China’s capital controls could lead to even tighter rules. U.S. Treasury Secretary Steven Mnuchin said he would “very carefully review whether they have manipulated the currency,” Reuters reported at the time. Although the “counter-cyclical” policy may ease pressure for a tariff revaluation, it poses a potential trap for China and a risk that it may validate currency manipulation claims. U.S. trade law defines manipulation as “persistent, one- sided intervention” to weaken a currency to gain an advantage in trade. China’s trading partners are unlikely to complain if the yuan’s value rises, but they may see the “counter-cyclical” push as proof that China turns depreciation on and off at will. “It’s true. China is manipulating its currency,” said a commentator in Barron’s weekly. “Yet contrary to the oft-voiced complaints by President Donald Trump, Beijing has taken active steps to boost the value of its currency, … not to lower it,” Randall W. Forsyth said. While China arguably manages the yuan’s value to maintain economic stability, its options may be limited if downward pressures persist. “Counter-cyclical” support is unlikely to continue for long before leading to losses in China’s foreign exchange reserves. The country’s forex reserves stood at U.S. $3.11 trillion in August after declining by $8.2 billion from a month before and barely rising by $5.8 billion in July and $1.5 billion in June. China’s government may be hoping that time will bring a resolution to the tariff conflict before it has to choose between unpleasant options. The last bout of “counter-cyclical” intervention lasted a little more than six months. “The currency’s depreciation pressure is expected to ease in the near term,” the official English-language China Daily said, citing unnamed analysts. A more permanent measure to manage depreciation pressures might be a further tightening of capital controls. But the choice could draw fire from the International Monetary Fund, which reluctantly included the yuan in its Special Drawing Rights (SDR) basket of “freely traded” currencies in 2016. China’s lack of progress on forex reforms has led to some harsh assessments of the IMF decision and China’s currency policies. “The IMF either knew or should have known that the RMB is not a true currency, but rather a derivative of the dollar, and pretended it was a true currency anyway to placate the Chinese,” Scissors said. Recently, China’s regulators renewed their pledge to gradually lift capital controls without giving a time frame. “The country will make the yuan convertible under the capital account in an orderly manner, and protect the interests of foreign investors,” the State Administration of Foreign Exchange (SAFE) said on Aug. 2 in a statement before the reserve requirement and “counter-cyclical” moves were announced. SAFE said it would “continue to reform its forex management in the latter half of 2018,” according to Xinhua.